SB 1258, passed in 2017 expands the purpose of the new SolarEnergy and Battery Storage Development Authority to include positioning the state as a leader in research, development, commercialization, manufacturing, and deployment of energy storage technology. Solar United Neighbors conducted an in-depth analysis of the current “state of the art” of solar + storage. It sought to determine if solar + storage is a viable means to protect vulnerable communities from the impacts of climate change. The research used the Hampton Roads, Virginia region as a test case. We modeled the financial feasibility of these projects and identified means to scale up their deployment. Join the conversation, stay informed, and help Virginia become more resilient. Sign up for our newsletter. Resilient Virginia – Leaders from government, the private sector, academia, and Virginia Sustainable Building Network (VSBN) in July 2014 formed a new organization, Resilient Virginia, to accelerate resiliency planning in Virginia communities. Virginia Department of Environmental Quality – Provides information on small renewable energy projects utilizing solar energy. 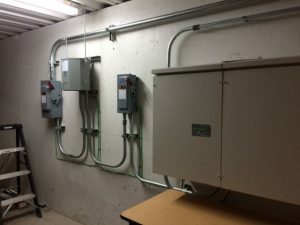 Making energy storage work in Virginia – How companies like Tumalow Energy Ingenuity are developing energy storage projects in the state.